Summary: As a (belated) Independence Day celebration, we look back at the fireworks stirred by the woman who declared her independence from 84 Lumber billionaire Joe Hardy. It's all thanks to an exclusive "ONLY ON 4" report, and guess what? She's writing a book! 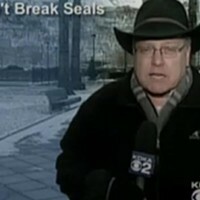 Reporter: Andrew Stockey, WTAE Channel 4 Airtime: 2 minutes, 11 seconds on May 19. Visuals: * The remains of Kristin Georgi's relationship with Hardy: designer shoes and purses scattered about. Highlights: * When Stockey barks, "Tonight, [Georgi] tells Channel 4 Action News why she left -- a decision that she says had nothing to do with their dramatic difference in age." * When Georgi acknowledges, "Well, everyone asks, 'Well, isn't that weird?' It really wasn't, 'cause he was very young, you know, at heart. So he was kinda hard for me to keep up with. ... Like when you kinda climb on your own jet for the 10th time and everything like in four days or something, you know. Europe was crazy ... and it was a little bit, um, too fast-paced for me." * When Georgi says, "He would tell me, 'If you see something you like, get four and five of them.' And I thought to myself, 'I can't do that. You know, this is Chanel sunglasses.' ... He gave me these things, but they're not something that I want. ... I still shopped at Target." * When Stockey reveals, "Kristin says the demands of such a lavish life took her away from her first love: her 2-year-old son. She chose Matthew over marriage." * When Georgi boasts, "As a mother, I can actually sleep every single night, and every single night I get to have this feeling of such pride in myself because I'm so proud of the decision that I made." * When Stockey adds, "A decision that cost her: a pre-nup limited Kristin's post-marriage payout. So, now she's writing a tell-all book about being married to a man 62 years her senior." * When Georgi posits, "I think that it will relate to a lot of mothers." * When Stockey concludes, "[O]ne question a lot of you may be asking tonight: Was the marriage consummated? Well, Kristin says she will answer that question in her upcoming, tell-all book." What We Learned: Apparently, a lot of mothers are going to be able to "relate" to the weariness of climbing aboard their private jets too often. Unanswered Question (That I Don't Ever Want Answered): "Was the marriage ever consummated?" News Value: 0. To date, the book hasn't been published -- but that doesn't mean we're safe.